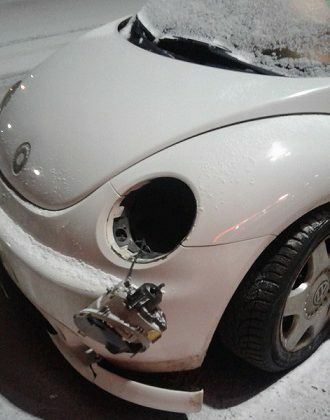 On February 10 at 5:50 PM, the Trail and Greater District RCMP Detachment responded to a call of a two car collision at the intersection of Victoria Street and Cedar Avenue in downtown Trail. 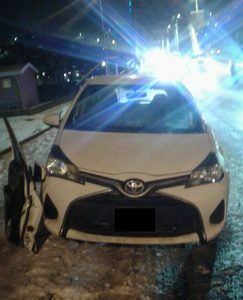 RCMP say a 26-year-old male driver t-boned the other vehicle in the intersection and then continued eastbound along Victoria Street bouncing his vehicle off the bridge numerous times before coming to a stop near 2nd Avenue. The driver was found to be non-responsive by the Trail Fire Department and BC Ambulance and had to be resuscitated. Both drivers were taken to the hospital for treatment for their injuries and were later released. The RCMP conducted an investigation into cause of the accident and determined that the impairment by a drug of the 26-year-old driver was a factor in the accident. The RCMP will continue to investigative the matter and charges will be forward to Crown Counsel for approval once the investigation is completed.